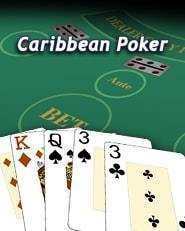 Caribbean poker is one of the video poker games in Oranje Casino, where the player plays as an individual against the dealer or bank. This is one of the popular games in the field of video poker in the English online casino. That is because this poker game offers the possibility to win a jackpot. The jackpot can go up to a few tons and that always has some extra appeal to players. This poker version, however, somewhat resembles the well-known board game yahtzee, which is played with dice and assigns a comparable value to the results. It is always possible to play Caribbean poker in practice mode, but it is of course much more fun and exciting to make money. The game can be opened in practice mode as well as real money mode, with a game table shown in both situations. The hands of the dealer are visible at the top of the screen and the chips with different values are available for the player to choose from. There can be played with different bets. If betting has been made, the player can share the cards by clicking the share button. Both parties receive five cards. One card of the dealer is visible and four are closed. After that, fold or raise can be chosen, with the game being played or not. It is in any case the intention that you as a player get a better hand with cards than the cards of the dealer . Royal Flush is the highest hand at Caribbean poker and consists of a hand with cards from 10 up to and including the ace in the same color. A straight flush then follows with five consecutive cards in the same suit. Next comes 4 or a child and that is a set of cards that have the same value, like four kings. With full house there are three cards of the same kind and two cards of a kind. If there is a flush then five cards have the same color and with straight there are consecutive cards in random colors. Then there is 3 or a child, where three cards have the same value. With 2 pair, there are two times two cards with an equal value and for 1 pair there are two cards with an equal value. In a combination as mentioned above, a price is paid if the value is higher in comparison with the hand of the dealer. Look here for more rules of ordinary poker. As a player you can play Caribbean Poker again and again in Oranje Casino and change the bet by clicking on ‘new’. The game can also proceed immediately with the same bet if it does not have to be changed. This can be done by clicking the share button. If you want to play for the jackpot, you should not forget to place an extra bet for the jackpot.